Before the concert began, musicologist Dr. Yuji Numano gave a lecture on the history of Western classical music in Japan, and in particular, how identity has informed the growing repertoire by Japanese composers working in the Western idiom. He opened by discussing the Meiji Restoration, when, in 1868, for the first time in two hundred years, Western music, culture, and goods were allowed to flow into the country without restriction. Less than half a century after the introduction of this new music, Japanese composers struggled with the question: how do we compose using Western instruments and Western harmony, but still express our quintessentially Japanese identity through music? Over the course of the following century, composers found various solutions to this tension, yet each had its problems. 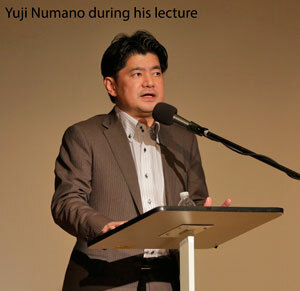 Dr. Numano concluded that only recently have Japanese composers synthesized something truly and uniquely Japanese in contemporary classical music, while at the same time avoiding the pitfalls of orientalism. “The Works of Misato Mochizuki” opened up with three pieces from her “Intermezzi” series. The series, inspired by Roland Barthes’ fragmented discourse, is a collection of pieces without a preconceived form. Instead, the form is defined as the piece unfolds, much like Barthes’ style of argumentation. In Intermezzi I, Margaret Kampmeier excited the strings of the piano with various implements, including a piece of a bicycle tube. The piece also called for the flutist, Elizabeth Brown, to play directly into the piano at times, so that the sounds of the flute would resonate through the piano’s strings when the pedal was depressed. 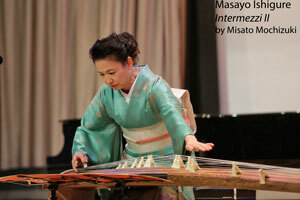 In Intermezzi II, for solo koto, Ms. Mochizuki sought to use the koto in ways that were not immediately evocative of the instrument’s history in Japanese traditional music. At first the strings were dampened by a cloth, to deprive the koto of its characteristic resonance. As the piece progressed, the cloth was removed, but soon enough, other extended techniques were used—the strings were scraped by the finger picks, and finally, in the finale of the piece, a ruler was run across the strings. 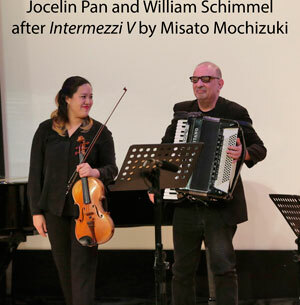 Intermezzi V featured an unusual combination of instruments—accordion and viola. 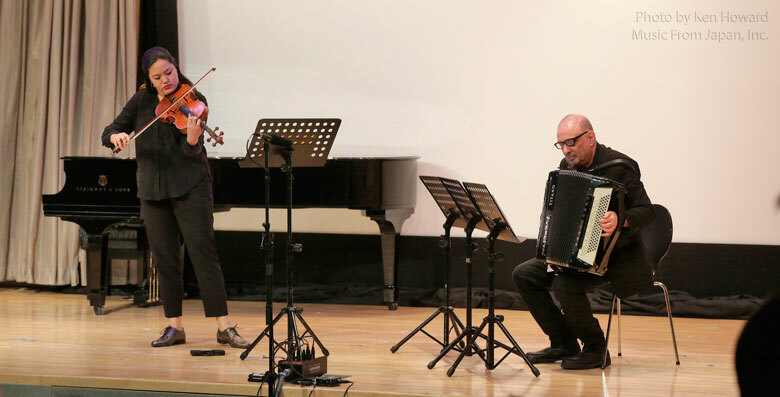 The opening of the piece featured the viola alone, in a kind of morphing ostinato, which included pitches spanning most of the viola’s large range. The use of the accordion was highly non-idiomatic—piercing high notes and the clicking of keys brought the instrument far out of its traditional role as a folk instrument. 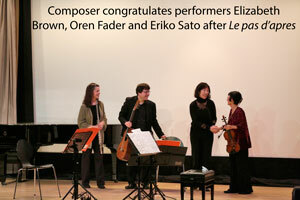 Finally, Le pas d’apres, which was commissioned by MFJ in 2002 for the Festival 2003, was performed. 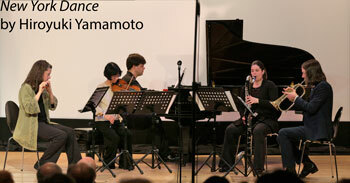 A trio of flute, guitar, and violin, the piece was percussive in nature. Tapping on the guitar coupled with col legno battuto (a technique that involves striking the strings with the wooden part of the bow) on the violin and accented staccato notes on the flute resulted in a highly pointillist texture. 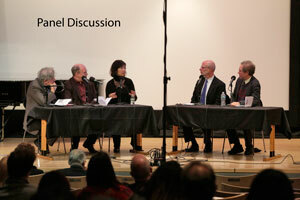 After the concert, composers Misato Mochizuki and Richard Teitelbaum spoke on a panel with critics Donald Rosenberg, Ken Smith, and Richard Ginell. Mr. Rosenberg moderated the forum. The discussion was mostly about Ms. Mochizuki’s music, her relationship to her own Japanese heritage, her compositional process, and especially the role of the program note and being able to describe and defend one’s work in general. 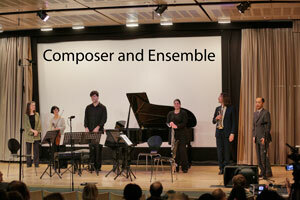 The Sunday concert featured eight compositions by eight different composers, all written in the 21st Century. Each one of the performances was an American premiere, except for New York Dance by Hiroyuki Yamamoto and commissioned by Music From Japan, which was a world premiere. 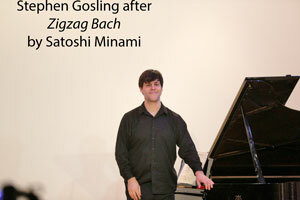 Much of the material from Satoshi Minami’s Zigzag Bach is quoted from Book I of J.S. Bach’s “Well-tempered Clavier,” Prelude in C, and A Musical Offering. While the references to the pieces were quite clear at first, the material quickly underwent transformations and soon enough only the impression of the older masterpieces remained in the music. 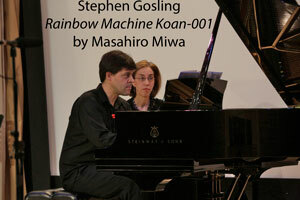 Next, Masahiro Miwa’s work Rainbow Machine Koan-001 was a flurry of notes from the piano artfully interpreted by the formidable Stephen Gosling. 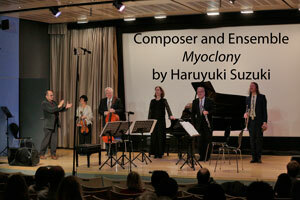 Myoclony, a work by Haruyuki Suzuki for violin, cello, piano, trumpet, and oboe, was intentionally disruptive in its flow. Throughout the piece Mr. Suzuki introduced both musical and theatrical disruptions in order to surprise the listener. Falling Dance, by Sunao Isaji, was delightfully evocative of Japanese culture while avoiding orientalist clichés. The cellist (Fred Sherry) and the pianist (Stephen Gosling) used their voices while Mr. Sherry made sweeping glissandi all over the range of the instrument. 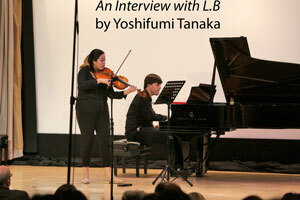 Yoshifumi Tanaka’s piece An Interview with L.B. 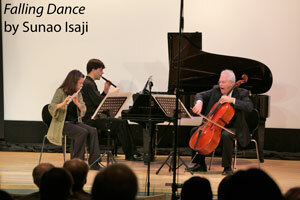 Interpreted by viola and piano was a kind of transcription of an interview of Luciano Berio by a Japanese scholar. The work is part of Tanaka’s series “The Speech Transplant Project” in which Mr. Tanaka attempts to transcribe speech into instrumental music, despite the challenges inherent in such a method. 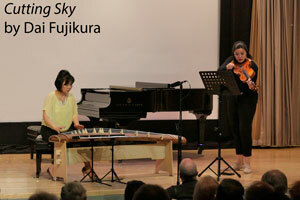 While all the composers featured in the Sunday concert are Japanese, Dai Fujikura’s Cutting Sky was the only piece that was written for a Japanese traditional instrument. 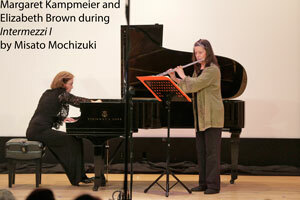 The piece, for koto and viola, found common ground between the instruments through the use of pizzicato. While the content of Akiko Yamane’s music is far from populist or condescending, she finds inspiration in pop culture themes, often regarded as naïve by the art music world. 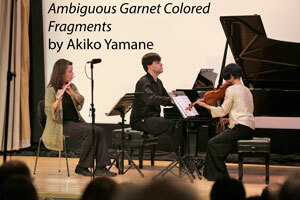 In this vein, her piece Ambiguous garnet colored fragments was based on her husband Motoharu Kawashima’s dance music piece A Paris. Finally, Hiroyuki Yamamoto’s piece New York Dance was performed. Unlike much contemporary music, New York Dance had a strong implied pulse, with thunderous accents and clusters alternating between the instruments. The forum following the concert included composers Hiroyuki Yamamoto and Haruyuki Suzuki, critic Nancy Malitz, and musicologist Yuji Numano. 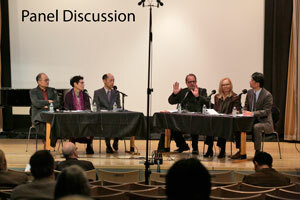 Carl Stone moderated the panel, and Sharon Nakazato interpreted. The forum began with comments about the preceding concert and how the composers related to the concepts of “Neo-Japonism” that Yuji Numano introduced in his lecture the day before. Afterwards, Nancy Malitz summarized a symposium that included MFJ and members of the Music Critics Association of North America that happened the preceding Friday, on February 26th. In particular she spoke about a new project that the Music Critics Association of North America has been developing and maintaining: a website called Classical Voice North America. Ms. Malitz explained that Classical Voice North America aims to “provide some of the support structure that was lost when print publications began their long decline” including, but not limited to, editorial support, design and layout, the gathering of photos and multimedia, and marketing. After the panel discussions, the conversation was opened up to the audience in a brief question and answer session. Overall, MFJ’s Festival 2016 facilitated an incredible amount of dialogue, both verbal and musical, between musicians, critics, and scholars from Japan and the US. 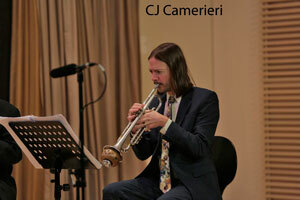 Composers and critics alike were given a voice in several different forums to share ideas, share work, and attempt to look towards the future of contemporary classical music.